Date/Time: Monday, October 29, 2018 at 2 p.m.
Open to both students and faculty. Food and refreshments will be provided. Here’s great news for Hajim students who want to study abroad: Our University has joined the Institute for International Education’s Global Engineering Education Exchange (Global E³) program. (Read more here.) This will make it even easier for our students to explore education abroad options at 39 top engineering schools in 23 countries. The fall application deadline is March 1, 2018. A letter of recommendation is required. For more information, contact the Center for Education Abroad Office at (585) 275-7532. You can learn about summer internships offered by the L.V. Prasad Eye Institute in Hyderabad, India, at 2:30 p.m. Friday, Feb. 2 in Dewey Hall 2-110E. The six-week unpaid internships explore technology development or public health related to the eye, in two tracks: community outreach and public health oriented experience, or innovation and technology development related to eye care. The Summer Undergraduate Research Programme at CUHK provides an opportunity for overseas undergraduate students to conduct eight weeks of research under the supervision of a CUHK faculty member and earn three credits. The program runs from June 24 to August 19, 2018. Optical mapping of ventricular arrhythmias. Trace gas sensors using laser spectroscopy. Autonomous agents and multiagent systems. Apply by February 28. Application results will be announced in April 2018. Hajim School students can benefit from global experiences of many kinds. 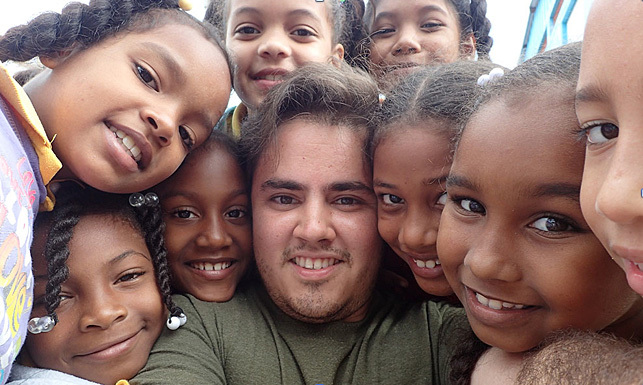 Six Hajim School students —mechanical engineering majors Grace Caza ’17, Burak Tuncer ’17, and Fernando Suarez ’18, biomedical engineering majors Eva Hansen ’18 and Dilshawn Gamage ’19, and Ab Salazar ’19, a dual major in computer science and economics— travelled to the rural community of Don Juan during winter break to implement a water disinfection system in preparation for supplying a primary school with potable water. This was the chapter’s third annual trip to the site as part of a five-year commitment to design and integrate the system and educate the community about maintaining it going forward. Huawei Technologies, an information technology company in China, is offering a two-week fully funded opportunity this summer for computer science and engineering students to experience Chinese culture and get hands-on ICT training. Apply by April 24. Read more here. 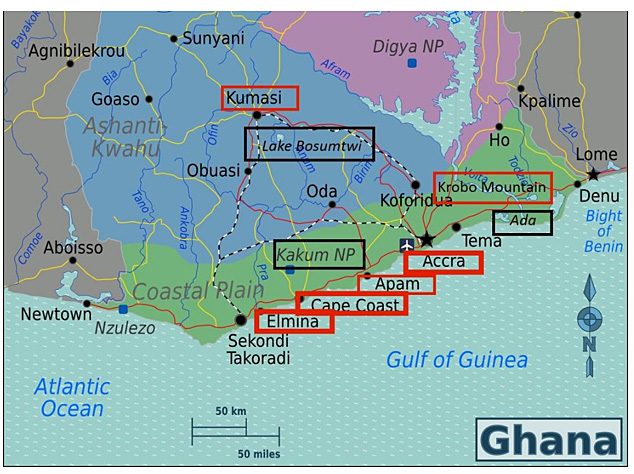 Students interested in an exciting overseas experience this summer — and earning six academic credits as well — can apply now to participate in the Ghana field school organized by Renato Perucchio, professor of mechanical engineering and director of the Archaeology, Technology, and Historical Structures program. From May 28 to July 1, ten to 15 undergraduate and graduate students in engineering, the social sciences, and the humanities will launch a multidisciplinary study of historic Elmina Castle on Ghana’s Atlantic Coast, engaging in structural analysis, historical and cultural context, surveying, and 2D and 3D modeling. There will be visits to eight other sites as well. Michael Jarvis, director of digital media studies who has similar projects underway in Bermuda, will be part of the team. 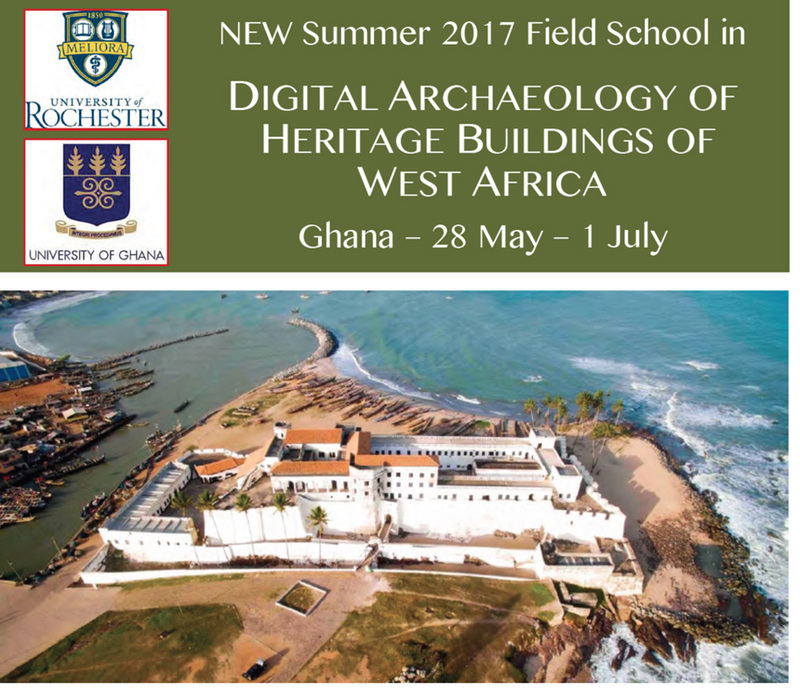 The field school, entitled Digital Archaeology of Heritage Buildings of West Africa, will be conducted in collaboration with the University of Ghana. Click here for the syllabus. The goal is to initiate a comprehensive multi-year multi-disciplinary study of not only Elmina Castle, but Cape Coast Castle, Fort Amsterdam, Fort Williams, Fort James and the Christiansborg Castle, all of which are UNESCO World Heritage Sites found along the coast of Ghana. Built in 1482 by the Portuguese Crown as São Jorge da Mina, Elmina Castle is the oldest permanent structure constructed by Europeans in Sub-Saharan Africa, and the first in a long series of fortified trading bases that various European countries established along the West Coast of Africa. Deadline to apply for this field school is March 31; applications received before 10 March will be accepted on a rolling basis. It is recommended that students contact Prof. Perucchio at rlp@me.rochester.edu before enrolling at the program page at the University of Rochester Education Abroad website. A global learning experience can build your confidence, broaden your horizons, strengthen your resume, and help you better understand engineering and refine your career goals. To help ensure the broadest possible participation of our students, the Hajim School offers undergraduates competitive $500 scholarships to help defray the costs of tuition, room, and board; books; local transportation; insurance; and international airfare associated with studying abroad. The awards can be applied to University Study Abroad programs, international research opportunities, international internships, and short-term faculty-led programs. The deadline to apply for scholarships for summer and fall 2017 is 5 p.m., April 3, when applications are due at 301 Lattimore Hall. Click here to learn more about applying. The American Councils Business, Technology, and Innovation Scholarship supports U.S. undergraduate and graduate students in business, innovation, and STEM fields who seek to participate in one of two established American Councils internship programs in Russia. Application deadlines are February 15 (summer) and March 15 (fall semester). BTI awards are made on the basis of financial need, program compatibility, and academic merit; awards range from $3,000 to $5,000. Elizabeth Stanitz ’18 of mechanical engineering, IES Queen Mary, United Kingdom. The awards can be used to help offset costs of program tuition, room and board, books, local transportation, insurance and international airfare. Read more here. The Nakatani RIES Fellowship connects U.S. freshmen and sophomores with the best of engineering and science research in Japan through a 13-week, summer research internship program. The program serves as a catalyst for U.S. students who are interested in future graduate study and research and contributes to the development of a generation of globally-engaged scientists & engineers who have the technical and culture skills to contribute to vibrant international research collaborations in the future. Up to 14 students will be selected to participate annually. The Nakatani RIES Fellowship for U.S. Students program will include the following program components. Online applications and two letters of recommendation must be submitted by January 12, 2017 at midnight in your local time zone. For questions, please contact nakatani-ries@rice.edu. Click here to begin the application process for the 2017 Nakatani RIES Fellowship for U.S. Students! 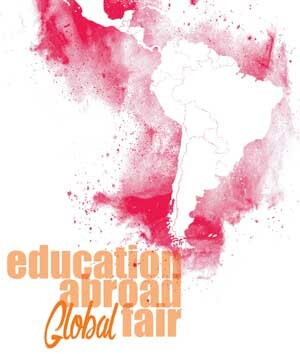 Learn more about education ab road opportunities at the Global Fair from 1- 4 p.m. Friday, Oct. 28, at Douglass Commons, Meliora Grand Ballroom. There will be information tables for all education abroad programs with which the University of Rochester has formal affiliations and exchange agreements. Representatives from the following programs will be present: the Institute for the International Education of Students (IES), the Council on International Educational Exchange (CIEE), and Internships in Europe (EPA). University of Rochester faculty will also be present with information on their summer programs including: Historical Archaeology Field School in Smith's Island, Bermuda (summer), French Sign Language and Deaf Culture in France (summer), Malawi Immersion Seminar (summer), and San Martino Archaeological Field School. Representatives from the Financial Aid Office will be on hand to advise students and a travel agent will be present to provide information about transportation and International Student ID Cards. Other offices that will be present to answer questions and provide information include: the Office for Minority Student Affairs, the Hajim School of Engineering and Applied Sciences, the College Center for Advising Services, the dean of freshmen, and the dean of sophomores and many other departments. "Before I came to college, I would never have thought that I would have my first professional experience at a start-up company in electrotechnical healthcare industry in Belgium," says Sophie Zhang '17 of electrical and computer engineering. This past summer, she participated in the EPA Brussels program through University of Rochester Center for Education Abroad office and had "one of the most unique and rewarding summers of my life in a beautiful European city – Brussels!" Sophie says the EPA program offered her a chance to enhance both her professionalism and world-traveling experiences. "I not only got to learn about technical entrepreneurship, business operations and software development, but also was able to meet people from all over the world and traveled to different countries." Read more here. Nicholas Boldt '18 of Biomedical Engineering has received a Gilman scholarship of $5,000 and a Freeman Asia award, which provides up to $3,000. Nicholas will be participating in a Japanese language program this summer in Osaka through CET Academic Programs. Five Hajim School students have received International Experience Scholarhips of $500 to $1,000. Raymond Chin '18 of Biomedical Engineering (Germany), Sheilah Kirui '19 of Biomedical Engineering (Chile), and Jorge Sanchez de Llano '17 of Computer Science (Russia) will study abroad this summer. Hong Chen '18 of Biomedical Engineering (Spain) and Luke Dengler '18 of Chemical Engineering (Australia) will study abroad this fall. Click here for more information about study abroad scholarhips. Questions? Contact Rohan Palma. Now she’s not only checked Russia off her bucket list, but also picked up some valuable research experience. Lee is one of six Institute of Optics undergraduates who attended the Summer School on Photonics at St. Petersburg’s National Research University of Information Technologies, Mechanics and Optics (ITMO) from May 28 to June 15. It is an example of the joint educational programs ITMO and the University of Rochester are pursuing as a result of a partnership agreement they signed last year. This was a great opportunity for Lee, for fellow rising sophomores Yang Deng, Lei Ding, and Kaia Williams, and for rising seniors Tyler Berryman and Guntis Rutins to engage in cutting edge research, such as generating and detecting terahertz waves using femtosecond-laser-indiced plasma and graphene, diffraction of terahertz waves on cuboids for medical applications, and quantum cryptography. It was also a great opportunity to explore the culture of an overseas city rich in history and art. Seven other Hajim School undergraduates are interning as DAAD-Rise scholars in Germany this summer. Luke Daily, a junior in Biomedical Engineering, at Friedrich-Alexander Universität in Erlangen and Nuremburg. Claire Kaiser, a sophomore in Biomedical Engineering, at the German Center for Neurodegenerative Diseases (Deutsches Zentrum für Neurodegenerative Erkrankungen DZNE) in Bonn. Tianyi (Linda) Liu, a junior in Biomedical Engineering, at Forschungszentrum in Jülich. Zhaoyu Nie, a sophomore in Optics, at Ludwig Maximilians Universität in Munich. Nathaniel Potrepka, a sophomore in Computer Science and Audio and Music Engineering, at the Bonn-Rhein-Sieg University of Applied Sciences at Sankt Augustin. Zhenzhi (Jane) Xia, a junior in Optical Engineering, at Friedrich Alexander-Universität in Erlangen and Nuremburg. So Han Florence Yip, a sophomore in Mechanical Engineering at Friedrich-Schiller Universität in Jena. Eleven other Hajim School undergraduates are participating in these other study abroad experiences this summer. Weijing Xu '18 of Chemical Engineering is with the German in Germany program. 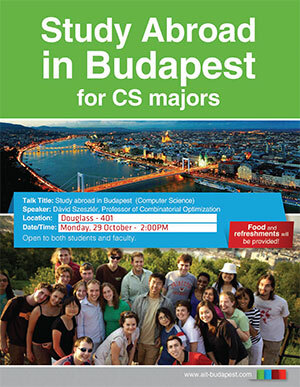 Imagine spending a semester on the banks of the “blue” Danube, studying at an elite Hungarian institute devoted entirely to computer sciences and software engineering and designed specifically for North American students. At an institute where instruction is in English and the class size is an intimate 5 to 15 students. And where the distinguished faculty includes András Falus (Professor of Genetics and Immunology and member of the Hungarian Academy of Science), software entrepreneur Gábor Bojár (founder of Graphisoft, a successful global software company from Central Europe) – and Ernő Rubik (the inventor of Rubik’s cube). The Aquincum Institute of Technology (AIT) in Budapest, Hungary, becomes an officially sanctioned University of Rochester study abroad site this fall. Som Liengtiraphan, a freshman in computer science and digital media studies, met yesterday with both a vice provost and the dean of engineering faculty from England's University of Bristol to discuss study abroad opportunities. It wasn’t long before her eyes lit up. Dean Nishan Canagarajah was describing how computer science students at Bristol work in teams to design brand new computer games during their junior year – the same year Liengtiraphan is planning to study abroad. The CIEE Gaborone, Botswana program is especially tailored for second-semester sophomores to make the study abroad experience seamless. All of the planning and course selection have already been done for you. All you have to do is follow the course sequence designed by the ME department and go. You will have plenty of opportunities to explore the local culture, take wildlife excursions, and make the most of your experience abroad. For more information please contact the Center for Education Abroad. For specific study abroad questions relating to ME contact Prof. John Lambropoulos (dept. chair). July 8, 2013: Hajim School students now have another exciting study abroad opportunity. Hong Kong University of Science and Technology, which is the top Asian university three years running according to QS rankings, has signed an academic exchange agreement with our undergraduate College, allowing the equivalent of four full-year undergraduate students to participate from each school each year. HKUST, which was founded in 1991 and offers all courses in English, had an enrollment of 12,584 as of Dec. 31, 2012. Its School of Engineering, ranked 27 among the world's top 200 according to QS, includes departments in chemical and biomolecular engineering, civil and environmental engineering, computer science and engineering, electronic and computer engineering, industrial engineering and logistics management, and mechanical engineering. Six ChemE courses at HKUST have already been pre-approved as equivalent to courses here, and no doubt others can be approved as well in consultation with department advisers. For more information, contact the Center for Education Abroad. Hajim School students are studying abroad in 13 countries this year, with Sydney, Australia, the favorite destination. All Hajim School departments are represented, with mechanical engineering leading the way with nine students studying abroad. They included Kyle Jensen, at left, who spent the spring in Christchurch, N.Z. Gregory Atkins, Mechanical Engineering, in Sydney, Australia. Louisa Bauer, Biomedical Engineering, in Dublin, Ireland. Gregory Corrado, Chemical Engineering, in Bologna, Italy. Nicole Fannin, Chemical Engineering, in Christchurch, New Zealand. Chris Frederickson, Computer Science, in Uppsala, Sweden. Eliezer Glik, Optical Engineering, in Sydney, Australia. Kristen Harding, Biomedical Engineering, in Sydney, Australia. John Hinkel, Computer Science, in Madrid, Spain. Kyle Jensen, Mechanical Engineering, in Christchurch, New Zealand. Jonathan Kho, Electrical and Computer Engineering, in Sydney, Australia. Hamed Kone, Chemical Engineering, in Sydney, Australia. Nicholas Lovullo, Optics, in Sydney, Australia. 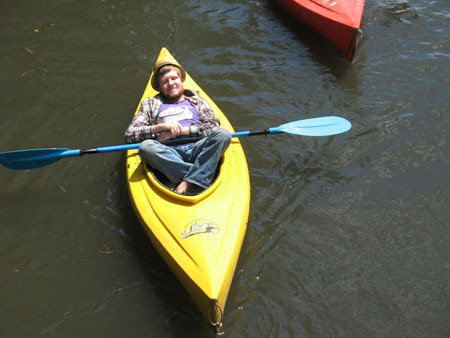 Eric Lynd, Mechanical Engineering, in Dublin, Ireland. Christopher Miller, Computer Science, in Budapest, Hungary. Joshua Morse, Mechanical Engineering, in Trondheim, Norway. Joseph Ricci, Mechanical Engineering, in Christchurch, New Zealand. Kelly Rousmaniere, Mechanical Engineering, in Sydney, Australia. Sarah Salvucci, Mechanical Engineering, in Copenhagen, Denmark. Megan Stockdill, Biomedical Engineering, in London, United Kingdom. Daniel Viterse, Computer Science, in London, United Kingdom.